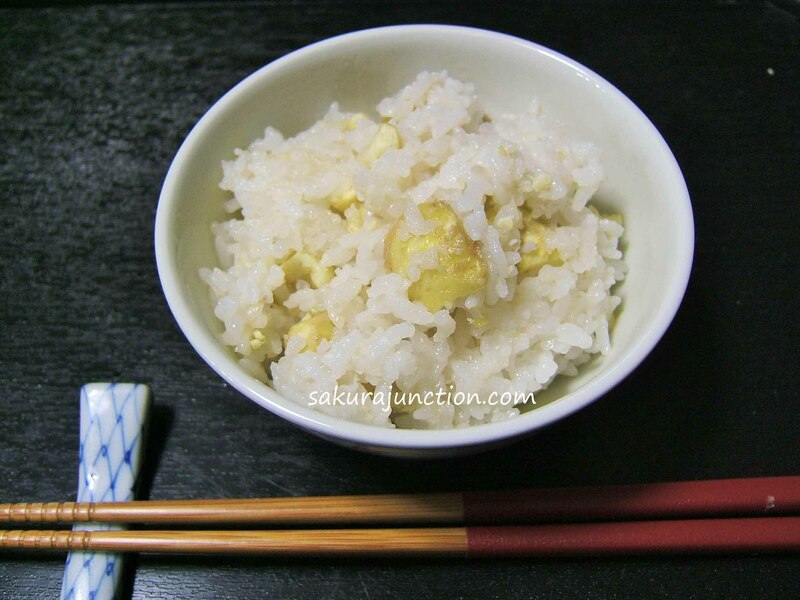 The most difficult part of making ‘Kuri Gohan’ is pealing the hard shells off Chestnuts. 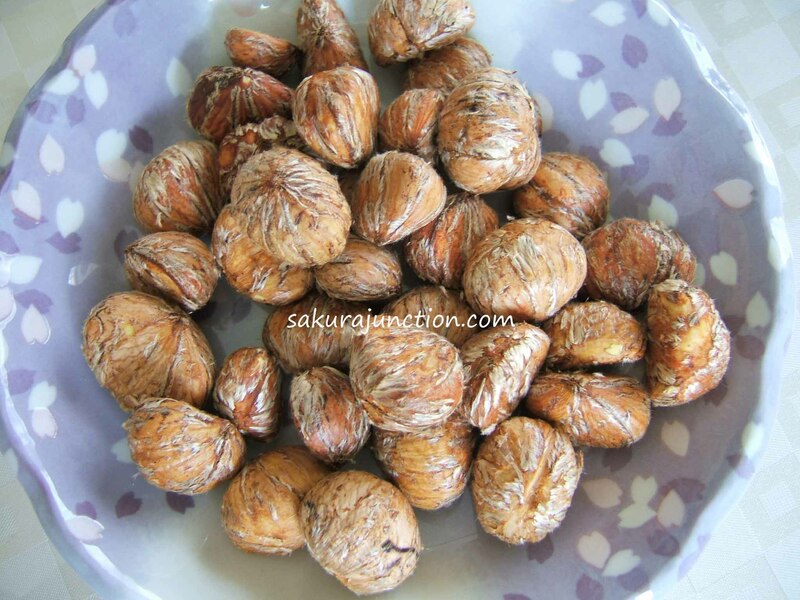 I found the shell of Japanese Chestnuts is a little softer than British ones and easier to remove. 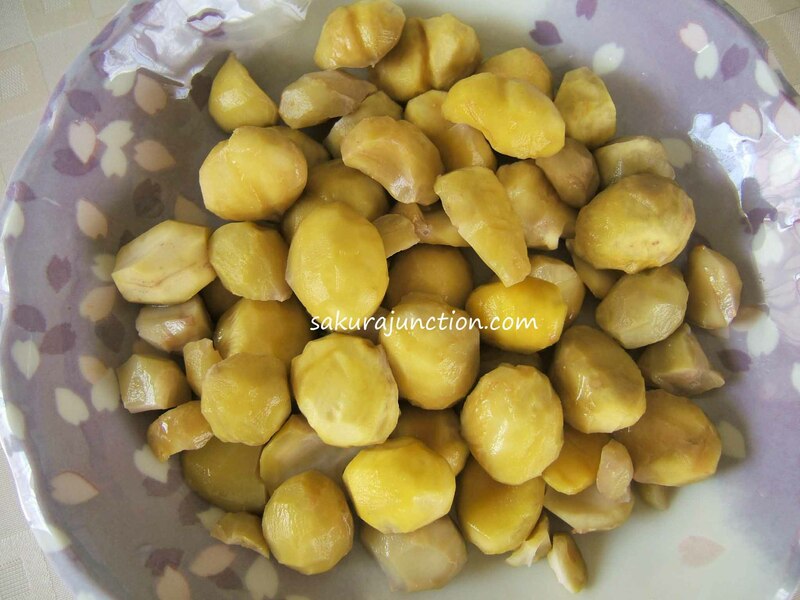 Remove the outer hard shells of Chestnuts first with a small knife and then cook the Chestnuts in boiling water for just a minute and drain them. When the chestnuts become cool enough to handle remove all the soft skin off by using a knife. Keep them aside. Rinse Rice and drain in a sieve for about 15 minutes. 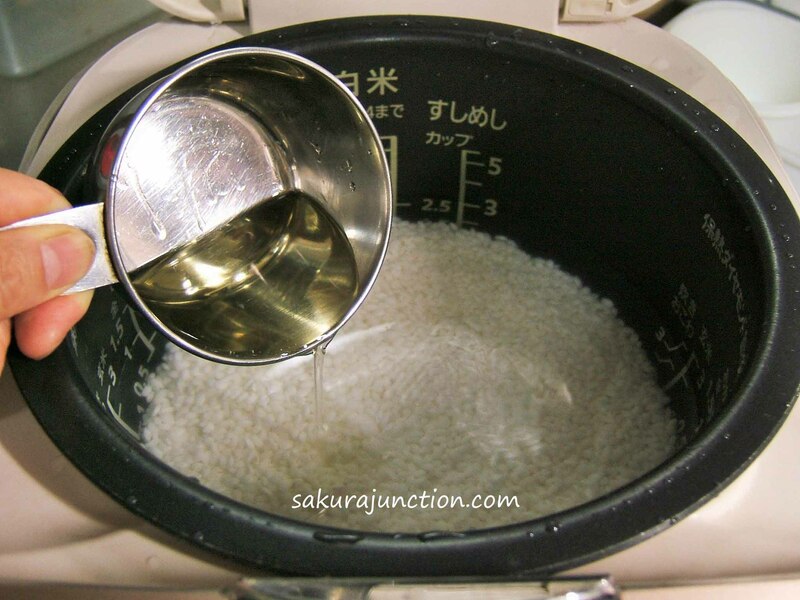 Place Rice into a rice cooker/pot. Add right amount of water for the Rice that you normally cook with. Keep the Rice soaked for at least 30 minutes. Mix Mirin, Sake and Salt (or light Soy sauce). Remove water from the pot that is the same amount of the mixture. Add in the mixture and then pealed Chestnuts into the cooking pot. Start cooking. If you have a rice cooker cook it as you normally do. If you use a sauce pan, start boiling it at a medium to high heat until it starts boiling. Reduce the heat to very low and do not open the lid. 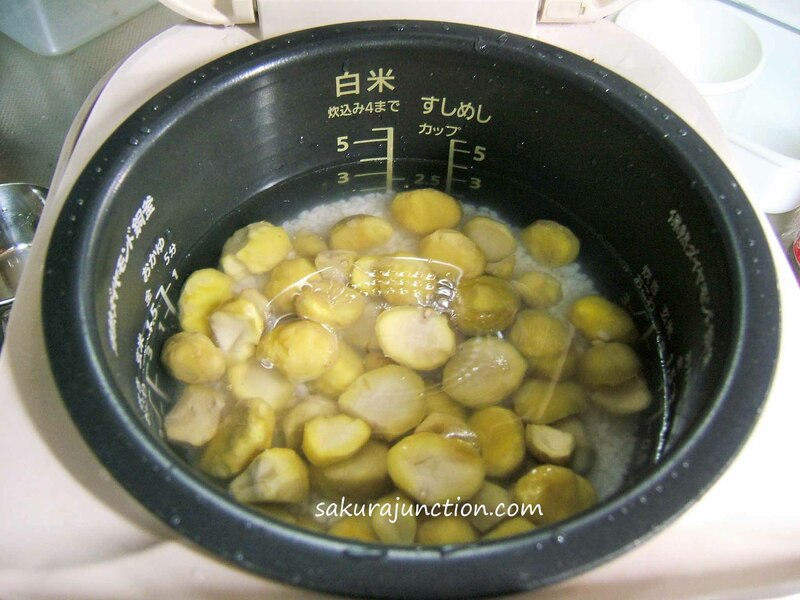 When it seems cooked check whether there is any water left at the bottom of the pan. Keep heating until the bottom seems to have no water and dry. Switch the heat of. Leave the Rice steamed by leaving the lid on for about 10 minutes. 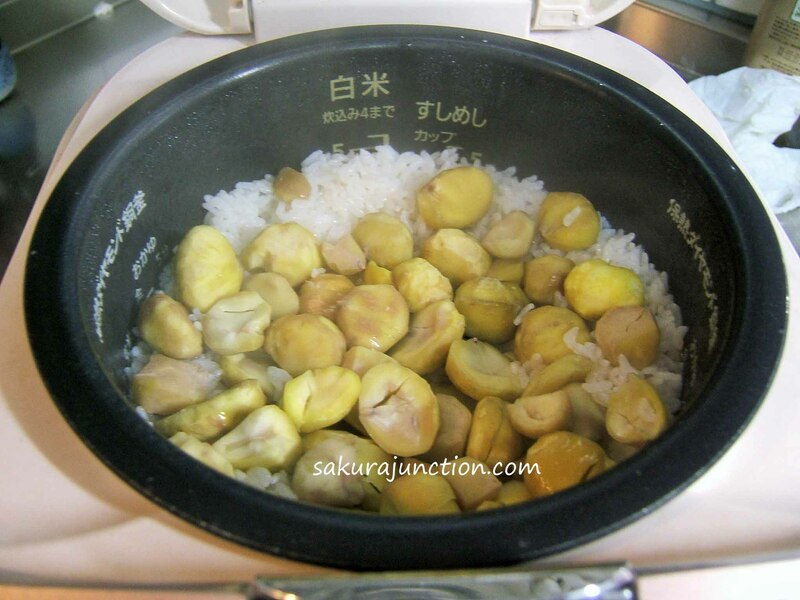 Open the lid and mix the Rice and Chestnuts gently. Do not stir up vigorously or it breaks Rice grains. Voila, you can have the taste of Autumn!! 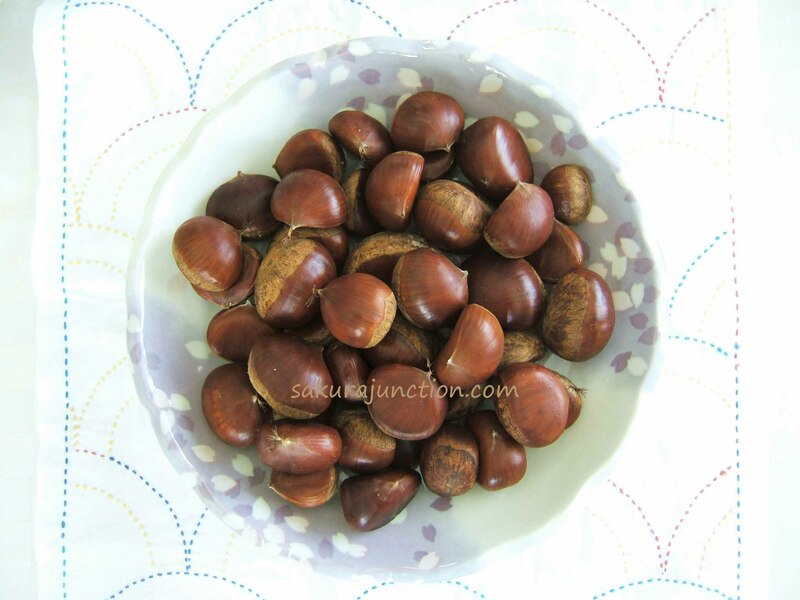 Boiling Chestnuts makes pealing soft skins easier. I never measure the amount of water for cooking Rice. If you don’t have any idea how much water to use, it should be almost the same volume as the Rice so that is about 540ml here. *By the way the cup we use for rice is 180ml in Japan. I actually used a little bit too many Chestnuts for this time, however, it really does not matter how big/small amount of Chestnuts you use. Whatever it is Kuri Gohan is always tasty!